In this letter dated June 11, 1912, Har Dayal discusses plans to publish a "radical," "propagandist" magazine to Stanford professor Van Wyck Brooks. Dayal mentions support received after a meeting from Dr. Hugel, Dr. Newcomer, and Dr. Sabine. Dayal also mentions possible titles for the magazine included The Radical Student, The University Radical, and The New World. Letter from Har Dayal to Professor Van Wyck Brooks dated July 12, 1912, written from Stanford University. Dayal describes going to the city, and meeting John D. Barry who intends to publish a small magazine in the style of Elbert Stubbard's Philistine. Letter from Har Dayal to Van Wyck Brooks, dated August 4, 1912 and posted from San Francisco (c/o Dr. H.M. Beck). Dayal mentions visiting Hindu farmers in Stockton, and having agreed to deliver a course of weekly lectures in San Francisco on social revolution. The first lecture was published in the Bulletin. Letter from Har Dayal to Van Wyck Brooks, dated January 13, 1913 and posted from Berkeley, California. Dayal mentions the Rice Institute in Oakland, and invites Brooks to speak on Whitman. Letter from Har Dayal to Van Wyck Brooks, dated February 10, 1913 and posted from Berkeley, California. Dayal responds to Brooks, who is going to England. Dayal also mentions that he has written a short essay on Jesus, on the suggestion of Bulletin editor John Barry. Letter from Har Dayal to Van Wyck Brooks, written on December 23, 1913 and posted from Berkeley, California. Brooks appears to have been visiting England, and Dayal asks about the people he is meeting. Dayal writes about the time he met Winston Churchill that October, who he found "a very mediocre kind of person." He also urges Brooks to meet Peter Kropotkin, if he has a chance. Short letter from Har Dayal to Van Wyck Brooks from 1914 and posted from Lausanne, Switzerland. Dayal requests Brooks to mail enclosed letters, but also not to tell friends about his arrival in Switzerland. Short letter from Har Dayal to Van Wyck Brooks, dated March 6, 1914 and posted from Berkeley, California. Dayal's letter accompanied five packages meant for the British anarchist Guy Aldred. The packages are labeled "V.W. Brooks," "Van W. Brooks, "Van Wyck Brooks," each name used to qualify a different "class" of package. The contents of the package are not given. Letter from Har Dayal to Van Wyck Brooks, dated April 30, 1914 and posted from Lausanne, Switzerland. In this letter, Dayal details his escape from the U.S., after being arrested for spreading anarchist propaganda in California and being released on bail. He writes, "The British govt. had preferred quite a number of charges against me & the 'investigation' was going on." 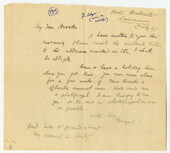 Letter from Har Dayal to Van Wyck Brooks, dated May 4, 1914 and posted from Lausanne, Switzerland. 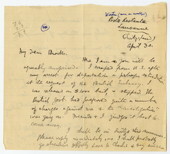 Dayal expresses his fears of being surveilled, advising Brooks not to openly support the Indian independence cause or to speak against England. Dayal also mentions Brooks should be careful about one of Brooks' acquaintances, L.